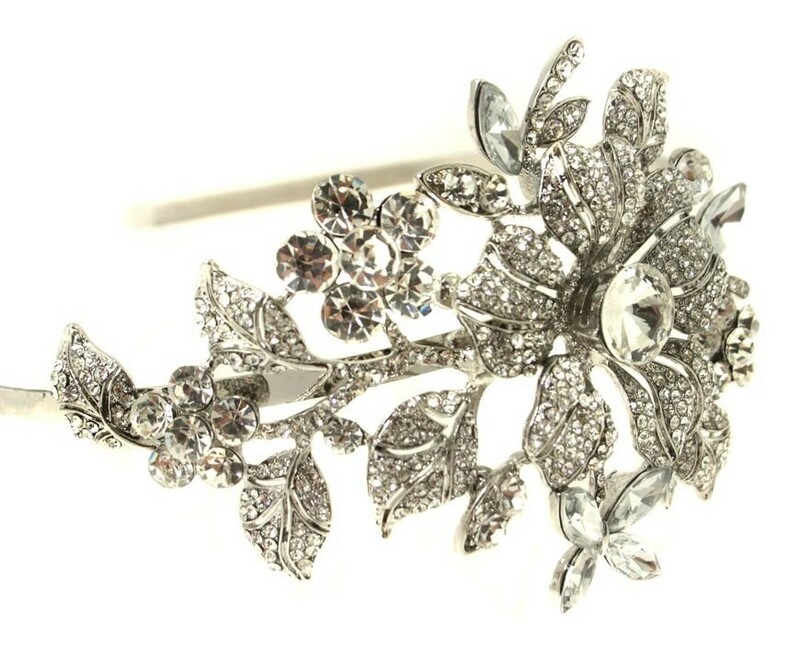 Bling is big this season, with winter fashion bringing as many jewels and sparkles as possible onto the catwalk. 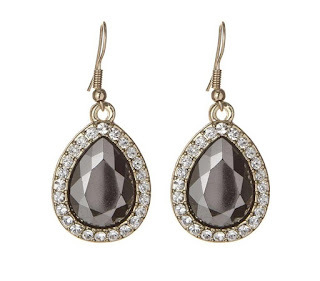 Dramatic statement pieces, heavy neckwear and layered chandelier earrings create a spectacular theatrical look perfect for those Christmas parties and decadent balls. Striking crystals and vivid colours are on show, styled with classic vintage gloves for a touch of Hollywood glam and finished with modish style shoes like these block heels from Office. 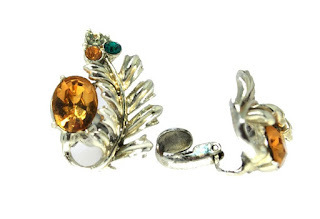 Or why not rock some 70s amber with our Vintage Jewelcraft Gold Leaf Earrings? 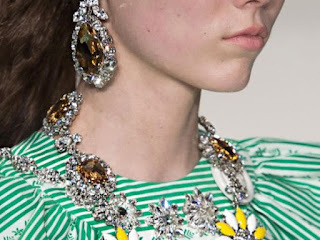 This season has reinvented past revivals with 70s style remerging as bigger and better, you can go all out seventies with these key vintage accessories. 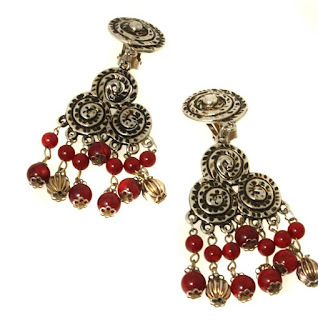 These Vintage Tribal Earrings are perfect for the festive season! 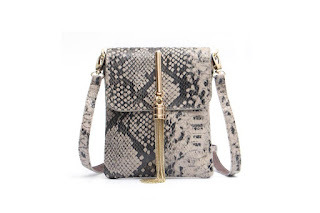 Go super seventies like Chloe with our Snakeskin Shoulder Bag! 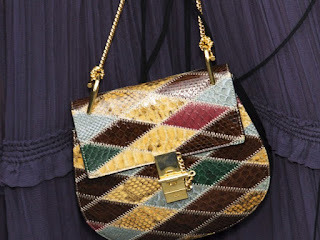 Swap and change to transform your outfits in minutes with our clutch bags, what could be easier than a detachable strap? Evening to party in one swoop. If you know of that special someone who would totally rock this trend, why not check out our shimmering pressies range and spread some Christmas sparkle! Lust further over the trends this season with our AW15 trend report. Take our fun vintage quiz and find out your perfect fashion era! Have you ever wondered what your perfect vintage fashion era is? 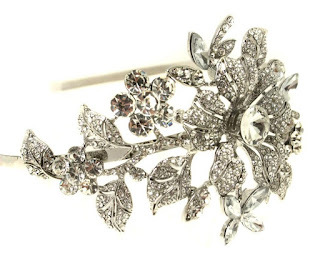 Whether you should be channelling Daisy Buchanan or Jackie O and what decade really suits your personality? Well, all you need to do is play our fab little vintage fashion quiz! Answer a few totally relevant questions (ok, maybe not totally relevant but still totally fun!) and our cute quiz tell you what era your heart really belongs to! We have all been chuffed to bits with the answers we have received and have already tried some of the suggested vintage style dresses and vintage accessories to style out our chosen era in style! 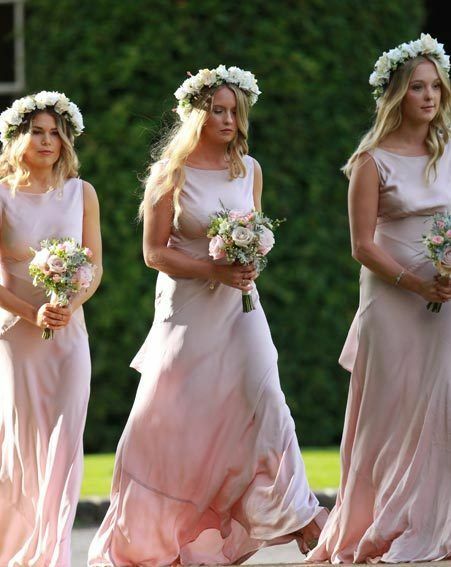 We know that all the eyes should be on the bride on the big day, but we’re always secretly lusting after those gorgeous gowns the bridesmaids are strutting around in too! 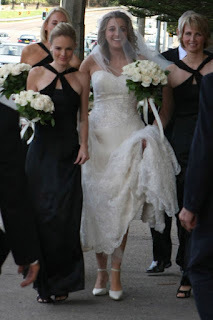 It's so easy to forget how stunning the rest of the wedding party can look when you're dazzled by the beautiful bride. With winter weddings coming up and brides planning for the next summer wedding season, we thought we would put together our favourite vintage inspired bridesmaid dresses that look just as romantic as the day itself. 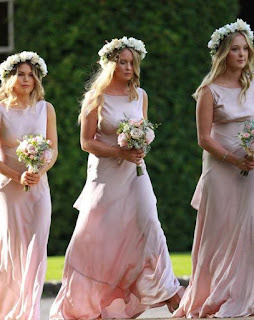 Millie Mackintosh made sure her bridesmaids looked pretty in pink back in 2013. For more Mackintosh/Green wedding inspo head over to One Fab Day. Get that dusky hue of Millie’s girls in our 1930s Beaded Maxi Dress. Kate Bosworth looking radiant in a flattering black gown, our Black Tassel Flapper is equally as sultry. 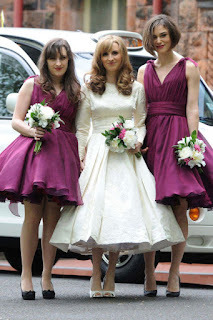 Perfect-in-purple Keira Knightley at her brother's wedding. Choose a flirty hemline like Keira in our Eucalyptus Darcie Dress or our Eucalyptus Yellow Prom Dress. Get 1970s style with our Coral Maxi Dress if you fancy something a bit more floaty and lightweight like the quirky Maggie Gyllenhaal. 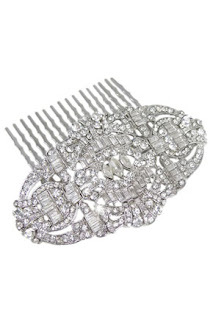 If you're the lucky bride searching for that frilly frock to throw on for the evening do, check out Amal Clooney in her beautiful wedding party dress, you can get the look with our Gold Fringe Flapper style. If you're stepping up for bridesmaid duty, then you'll love our collection of vintage bridesmaid dresses, perfect for summer and winter weddings to make sure the bridal party shines. Even if you’re not a bridesmaid (this time) we have a gorgeous collection of vintage wedding guest dresses too. 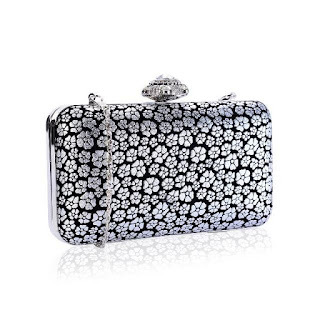 All you need to RSVP in style! Enter the Flapper! With her stylish short bob and fresh concept of the ideal woman, she celebrated modern ideas about womanhood and appropriate female behaviour. 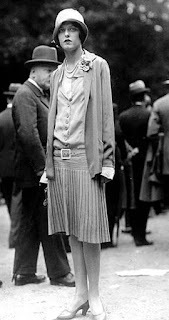 This innovative young woman wore a new style, totally rejecting past fashion! 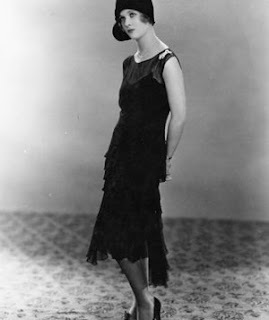 Instead of emphasising the female figure, as past dresses were intended, this new style had a more masculine shape, with a loose waist, flat chest and shortened hem – ooh how we love those short flapper dresses at RMV. 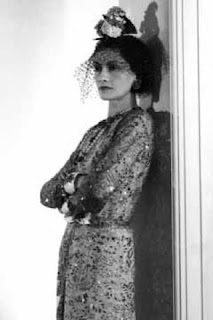 This was a complete contrast to the Victorian ideal of petticoats, corsets and crinolines used to accentuate the female shape (however much we LOVE the flapper dress, we’re not forgetting how fabulous a corset is… we love you Dita!). 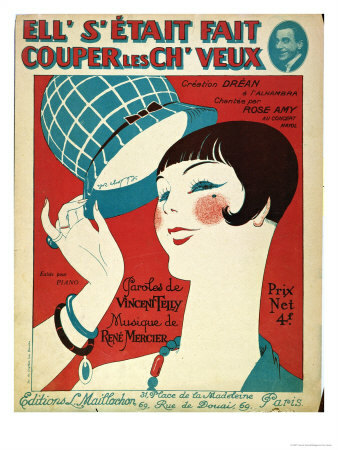 Cover for the music score 'she had her hair cut' in 1924. This was a bold move for women, discarding traditional fashion rules and celebrating a more modern, fast-paced lifestyle. Due to the simplicity of the patterns women could now easily make these styles at home (we’re picturing fancy flapper girls stitching and sewing in their bedrooms) - accessible shimmying for all! 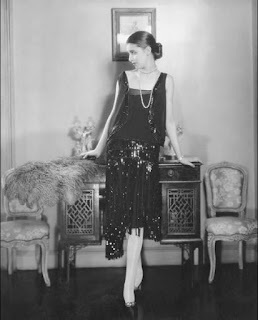 Model showing off a beautiful black Chanel flapper dress, you can find a similar style here. This gorgeous piece reminds us of our 1920s tassel dress and our black sequin flapper dress with full on sparkle! Just like the photo, you can add some Chanel-chic to your outfit with these vintage style pearls. The flapper dress shaped fashion for the future and is still one of the most fabulous frocks to wear today! Forever appearing on the catwalk and the red carpet, take this super flirty dress Cara has on here; we adore her take on timeless flapper fashion, read more on our Style Steal blog post here. 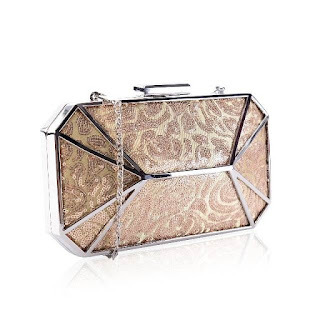 Take a look at our fabulous flapper fashion picks below; this is how we rock the look! We adore the feather hair decor in this stunning photo. Love the flapper cape sleeve? Check out our beaded playsuit! 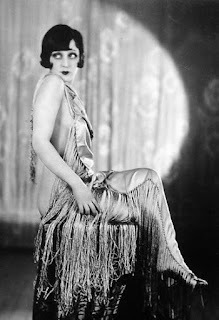 If you fancy a flirty flapper maxi like in this image, we have it sorted. Go ahead....get that full on Gatsby glamour in time for the party season and rock your flapper dress just like they did in the roaring twenties! You can recreate Cara's party-perfect look and get your Gatsby on here. Our range of flirty shimmering frocks will attract green-eyed envy at the party. 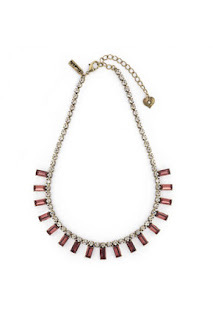 Whether you're after beads and lace or fringe and feathers, we've got them all! 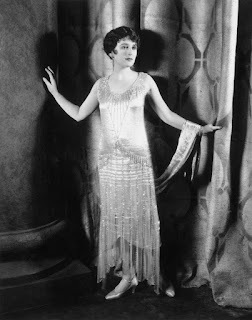 If your flapper fancy is inspired by Louise Brooks, try a number with a low V neck back like our Frock And Frill Zelda Dress or if you want to shimmy like Clara Bow our Gold Fringe Flapper Dress really shows sass! This week we’re totally inspired by Ken Harman’s 6th annual Wes Anderson art show recently exhibited in New York. We love the quirky style of the characters from the films, from Agatha’s cute bow dress and Suzy’s peter pan collars to melancholic Margot’s sultry edge, the films never disappoint! Check out exhibition photos here. 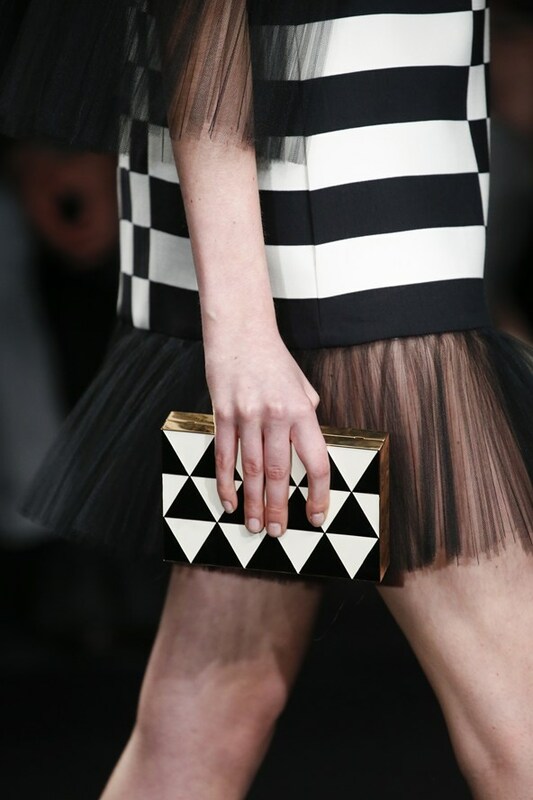 If you’re still lusting after the kooky outfits long after the film has finished, don’t fret! 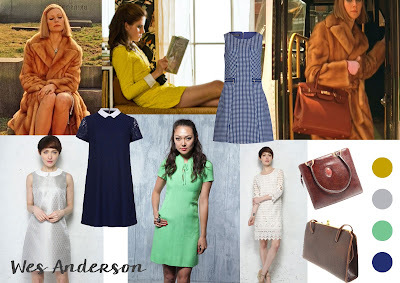 We have some great pieces for you to recreate that nostalgic Wes Anderson look. If morose Margot takes your fancy try these key shift dresses, layer up with a vintage coat and hair accessories. Or tie yourself a bow like Agatha!